OMV Petrom, the largest oil and gas producer in South-Eastern Europe, and Ford Romania, a subsidiary of the US Ford Motor Company, have signed a memorandum of understanding for the development of a strategic partnership. The memorandum defines the main aspects of cooperation between the two companies. These start with joint business actions-such as servicing autovehicles manufactured at the Ford factory in Craiova with Petrom fuels and will continue with an analysis on the mobility needs of young families in Romania, through a dedicated market study. Another aspect concerns the development of professional education in Romania. A joint activity already took place, with Ford engineers attending the Vocational Summer camp from Andrei’s Country programme, in the session dedicated to auto mechanics. “This memorandum lays the grounds for future collaboration between Petrom, the most trusted brand of Romanians and Ford, both brands being major players in the Romanian economic landscape, both active in industries which contributed significantly to the economic development of Romania. For Petrom, we are talking about investments of approx. EUR 1 bn per year and state budget contributions of approx. EUR 2 bn annualy. 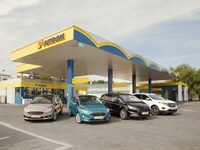 Through strategic partnerships such as the one with Ford Romania, we have direct contact with the automotive industry which is the most relevant for us, as fuel producers.”, said Mariana Gheorghe, CEO of OMV Petrom. The first steps in the partnership between OMV Petrom and Ford Romania concern the supply of Petrom fuels, produced in Romania, for the new Ford EcoSport units, a model for which official production started on October 12 at Ford’s plant in Craiova. Ford vehicles produced in Craiova leave the factory fueled with Petrom products from the start. Following the execution of this memorandum, a Petrom fuel station will operate on the premises of the Craiova factory, destined for the production line. OMV Petrom is the largest integrated oil group in South-Eastern Europe with an annual oil and gas production of approximately 64 million bep in 2016. The Group has a refining capacity of 4.5 million tons a year and operates an 860 MW high efficiency power plant and a 45 MW wind farm. On the oil products distribution market, OMV Petrom was present on the Romanian and neighbouring markets through 785 gas stations, at the end of March 2017, under two brands, OMV and Petrom. OMV, one of the largest listed industrial companies in Austria, holds 51.01% of the shares of OMV Petrom. The Romanian State, through the Ministry of Energy, owns 20.64% of the shares of OMV Petrom, „Fondul Proprietatea” Fund owns 9.9985% and 18.35% is freely traded on the Bucharest Stock Exchange and the London Stock Exchange. Since 2007, OMV Petrom has incorporated the principles of corporate responsibility in its business strategy. During this period, the company has allocated about 49 million euro for the development of Romanian communities, focusing on environmental protection, education, health and local development.